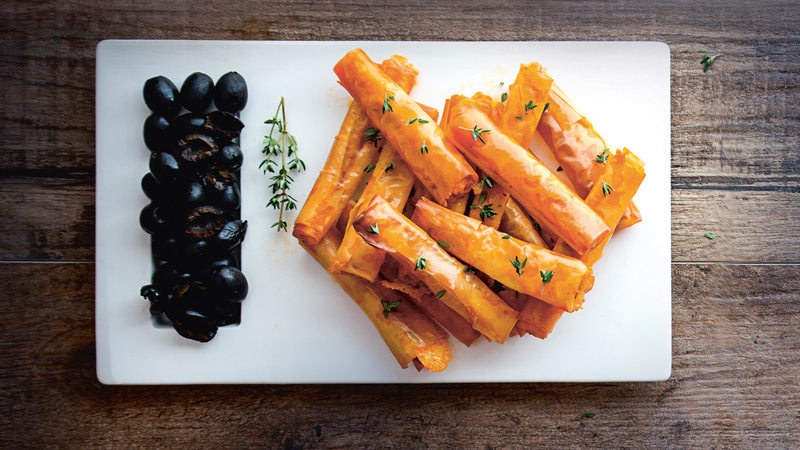 We have your party nibbles sorted with Clare Anne O'Keefe's delicious chorizo and rosemary filo straws. 1. Preheat the oven to 180 degrees/gas mark 4. Line a baking tray with non-stick baking paper. 2. Cut the chorizo into thirds across the diameter, then cut each chunk lengthwise into eight even strips. Cut the cheese into 24 strips that are the same length as the chorizo strips. Cut the filo pastry sheets into thirds horizontally and vertically to form small rectangles. 3. To make a straw, brush the edges of the pastry retangles with a little olive oil. Place a strip of chorizo and cheese along the longer side of the rectangle. Roll up the filling in the pastry, tucking in the open ends as you go. Place on the lined baking sheet and repeat with the remaining pastry, chorizo and cheese. 4. Bake in the oven for 12 minutes, until crisp and golden. Serve warm with the olives on the side and garish with the fresh thyme.